From the New York Times This is dedicated to: Carla, Simon, Luis, Ted, Kathy, Mark, Chris and Brian as they are true warriors as they did this race and or TransAndes. MATINA, Costa Rica — Just keep moving. Even if only an inch forward. That’s the key. 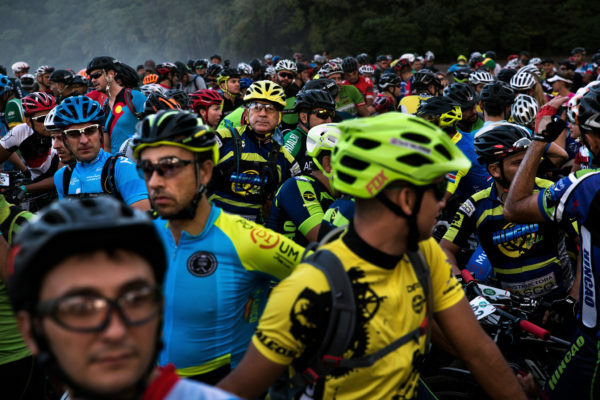 How else would cyclists riding in La Ruta de Los Conquistadores — a mountain bike race marketed, quite reasonably, as the world’s toughest — make it to the finish line in one piece? How else would they conquer a merciless route that includes steep climbs, choking humidity, muddy jungle trails and swift-moving rivers that may or may not contain the occasional hungry crocodile? But first things first: If they did not press forward, how would they get off this bridge? The course on this, the third and final day of La Ruta, was flat, and the finish line beckoned from a soft-sand beach less than 20 miles down the road. But first there was a cruel twist. Before they reached the beach, competitors had to traverse railroad tracks that crossed several high bridges like this one, with murky rivers swirling ominously below their unevenly spaced wooden ties. The ties could be rickety, or slick with oil, or set wide enough apart for a human body to slip through — or all three. To cross, hundreds of cyclists had to carry their bikes, or roll them, as they stepped gingerly, silently and in single file, as if in a church procession. Not everyone could handle the stress. One racer near the front of the pack dared to look down between the wooden ties and froze, immediately creating a backup of riders who wanted nothing more than to keep moving, if only an inch, because momentum helped their balance. The rider, a Costa Rican, needed to be rescued by a wooden cart that was kept handy to ferry “chicken people who don’t want to walk,” said the race’s founder, Román Urbina. But as the cart rolled away and the bottleneck cleared, the real question about the race was not how the riders would complete it. It was: Why did they start it? In the early days, according to Urbina, the race started at the Pacific Ocean and went clear across Costa Rica to the Caribbean Sea, following a compilation of routes taken by Spanish conquistadors in the 16th century. But this country — famed for its raw beauty, with its lush foliage, multicolored macaws and fog-covered mountains — has grown much since La Ruta’s debut race in 1993. More buildings. More highways. More cars. More of everything, it seems, and that has meant fewer ways for cyclists to go all the way from coast to coast without bumping into something impassable for a person on two wheels. The race this year was a total of 135 miles. But it is the terrain, not the distance, that makes La Ruta so painful. Last year, Urbina had to modify the race route to avoid La Ruta’s usual grueling trip up and over the Irazú and Turrialba volcanoes, a path covered with ash and riddled with sharp pumice. Turrialba had become too active, organizers decided. Instead, the course charted an alternative. But in typical La Ruta fashion, the detour was not easier; somehow, Urbina found something more challenging than scaling an active volcano on a bicycle. So on Nov. 2, the eve of this year’s race, Urbina gathered the riders and, in his usual calm voice, explained that this alteration had produced “probably the hardest stage we’ve had in 24 years.” He had added an improbable climb up the side of a mountain. The mouths of a few of the riders nearly hit the ground. But not all of them. In the room that day was a curly-haired, piston-legged banana picker named José Santos Miranda Blandon. Nearly everyone associated with La Ruta knows him as Tinker Tico. 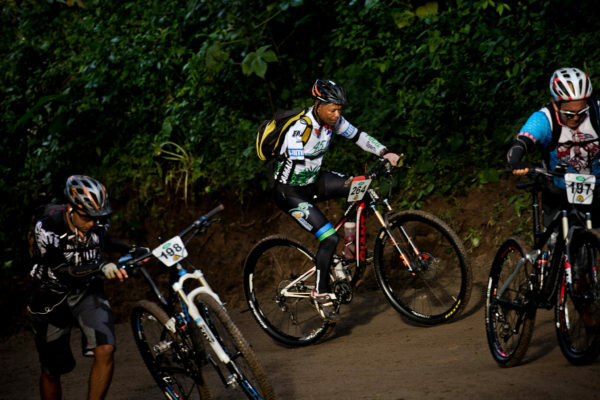 Blandon got his nickname more than a decade ago, when he was competing in La Ruta and met David “Tinker” Juarez, a prominent American mountain biker and BMX racer. Juarez, a two-time Olympian, had long black dreadlocks. Blandon’s black hair looked similar. So someone — no one remembers who — branded him Tinker Tico, the Tinker Juarez of Costa Rica. The name stuck, mostly because Blandon wanted it to. He likes having an alter ego. In real life, Tinker Tico picks bananas for a living. He lives in dormitory-style housing on a banana plantation in the town of Siquirres, about 60 miles northeast of Costa Rica’s capital, San José. Now 40, he has lived there, in the exact same spot, for most of his life. A padlock on his door protects everything he owns. Tinker Tico was happy to show me around his home during the week of La Ruta. A bare light bulb on the ceiling cast a weak glow over the space — a room about 12 feet by 10 with plywood walls and a concrete floor. Along one wall was a twin bed with a thin mattress covered by threadbare sheets. Along another sat a dusty refrigerator, unused because it had long been out of Freon. On the dusty walls and ceiling were cycling posters and dusty blank CDs in silver, red and green. Tinker Tico had affixed them with glue years ago, a bachelor’s effort at home decorating. He is proudest of his cycling medals: about three dozen in all, hanging from a long, thin piece of wood nailed, slightly askew, to two of the walls. The medals are mostly from local races, but there are no finisher’s medals from La Ruta, even though he has completed the event every year since 2002. He reached behind a sheet that covered a bookshelf — his makeshift chest of drawers — and grabbed the two thin, dirt-stained T-shirts and the torn denim shorts that he wears in the banana fields. Then he shook his head. He dreams of leaving all this behind, for a life in cycling. For so long, nearly every day has been the same. Six days a week, wake up at 3:30 a.m. Be at work by 4 a.m. to find out the day’s assignment, as either a picker or a cutter. As a cutter, he will wield a machete and slice bunches of bananas from the trees. As a picker, he will carry about 20 bunches of bananas on his back at a time — a load of about 70 pounds — to a series of metal wires that serve as a slide. Tinker Tico will carry bunch after bunch, about 200 in all, until his workday ends at 2 p.m. For his great effort, he earns about $250 a month. “It’s not hard,” he said. But this is someone who insisted that La Ruta was not that hard. Do not believe him. 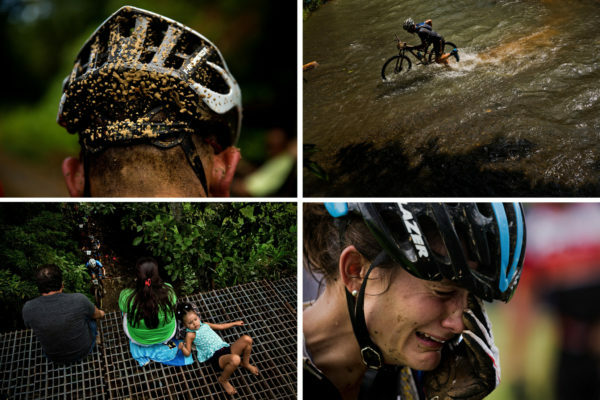 During the riders’ meeting, Urbina, a former triathlete with a reputation as an adventurer, warned competitors to take extra care when racing in Carara National Park, a thick rain forest. 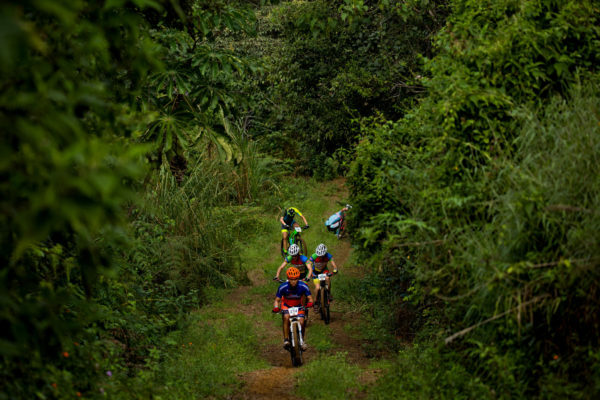 The race was headed into the jungle on its first day. 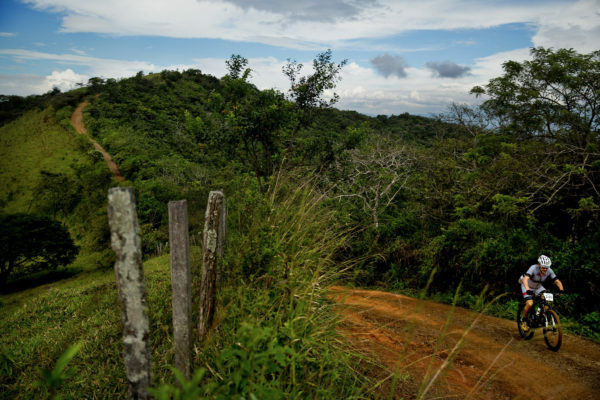 Cars and even four-wheelers cannot fit on Carara’s narrow, undulating paths, which can be knee-deep with clay-like mud, he said. Vehicles cannot get through the river crossings, either. So for anywhere from one to three hours, the riders would be on their own in temperatures that could reach 100 degrees. Urbina tossed out the prospect of rescue by helicopter if there was serious trouble, but just as quickly yanked that lifeline away. “We have a heli-vac, but the jungle is so dense, it’s almost impossible to heli you out,” he said. It is completely impossible when race organizers do not know where to find you. Last year, a cyclist rode into Carara and did not come out. At least in the conventional way. That was Mark Lyons, a 55-year-old endurance racer from Pine, Colo., who lost his footing while crossing a river that was about thigh-deep. There were no other racers around when Lyons and his bike were swept downstream, so he vanished. He made it ashore about a mile and a half away, shoeless and without his bike, cellphone or GPS. Exhausted and nursing several broken ribs, he spent the night in the jungle alongside insects, poison dart frogs, monkeys and boa constrictors. It would be 30 hours before Lyons was rescued, and only after he stumbled out onto a nearby road. Here’s a hint that a bike race is going to be filled with unconventional obstacles: At the starting line this year, the official race helicopter hovered so close to the cyclists that the wind generated by its blades blew some of them over. The unfamiliar jungle animals, jaguars included, are one kind of worry; sleep deprivation is another. One day, racers had breakfast at 3:30 a.m. for a 5 a.m. start. But the three long days of racing were even longer than Lea Davison, a two-time United States Olympian in mountain biking, expected. Before La Ruta, her longest day of racing had been four hours. During La Ruta, it was about six. For others, it was 12, which was the cutoff each day for officially remaining in the event. Davison was not used to this. 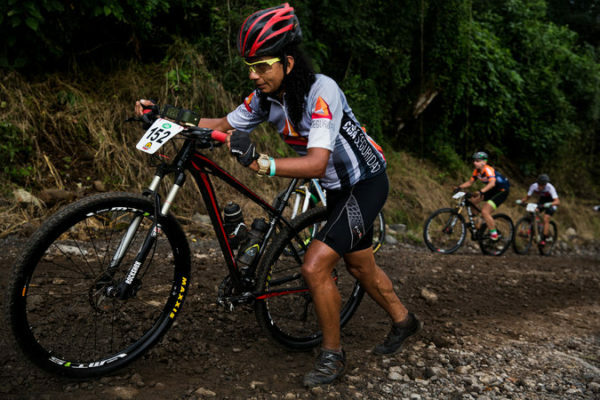 She arrived barely three months after finishing seventh in the women’s mountain bike race at the Rio Olympics, having been coaxed into competing in La Ruta by her bike sponsor, Specialized. As she stood at the starting line with a helicopter ominously close, she was still not sure what she had gotten herself into. Fortunately, the fans and the atmosphere help push the riders along. Villages and towns along the course throw La Ruta parties, with residents gathering in front of corrugated metal houses wielding pots and pans to bang as the racers speed, roll or limp past. Schools let students out of class to cheer, too, with the groups resembling official pep squads in their colorful uniforms. One good Samaritan who had participated in La Ruta in the past followed the riders in his sport utility vehicle, which he had turned into a mobile bodega. He called out to them, offering Coke, water, oranges and Alka-Seltzer, all for free, out of empathy. He raced ahead or hung back to set up shop close to the most challenging spots on the course, and when cyclists arrived at his bumper, many looked as if they had stepped straight out of “Heart of Darkness.” They were blank-eyed, dripping with sweat and speckled, Jackson Pollock-like, with dark mud. Some were in tears. The worst part was Day 2, which was as tough as Urbina had promised. Riders were forced to carry or roll their bikes straight up a laughably steep mountain path. At the top of the six-mile climb, there were giant white windmills that overlooked San José on one side, and a green, lush valley on the other. But Davison, and others, ignored the view. About 20 feet from the top, she met her sister, Sabra Davison, and a team from Specialized that was serving as her pit crew. One aide replenished her water. Another squirted cold water onto her head. A third fed her energy gels. The last person washed her bike and adjusted its gears. Davison stood there, pale as a zombie. When her sister offered encouragement — “Good girl, you got this, great job” — there was no response. None of the riders disagreed. There are as many reasons people ride La Ruta as there are people who ride it. Jamey Thompson, of Tallahassee, Fla., came for the physical challenge. He rode a single-speed bike — one gear for every incline, descent or obstacle — which means he likes to torture himself. Brent Sparkman, also from Tallahassee, first finished the race in 2011, an accomplishment that doubled as a salve for his recently broken marriage. He and his current wife, Christi Sparkman, who competed in La Ruta after they met, have the race’s logo tattooed onto their calves. This year, Christi’s 17-year-old son, Chad Hale, also competed, winning in his age group. 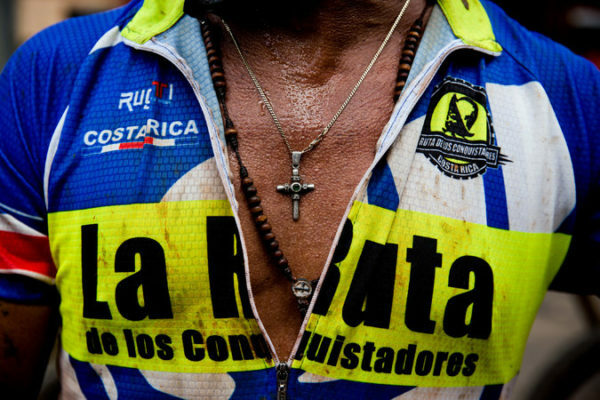 Costa Rica’s Alejandro Oporta, 53, said that he raced La Ruta every year because it brought him closer to God. He has a lot to be thankful for. When Oporta was 27, he walked home after drinking with some work friends and passed out on a set of railroad tracks. He woke up the next morning, in the hospital, with a mangled right arm. A train had run over it. Ten days later, the arm, including his right shoulder, was amputated. As for Tinker Tico, he rides for the future. The real José Santos Miranda Blandon was not the kind of guy to wait in a long, nervous line to cross the railroad tracks on the race’s final day. He had already been racing for hours, having risen earlier than most of his rivals to go on an optional rafting trip — in full racing gear, as required — to earn a five-minute bonus on his overall time. Now, on the first bridge in the area of Costa Rica he knew the best, on the bridge where he had practiced before, Tinker Tico looked like he was about to pick up even more time. While other racers inched forward, watching their every step, he was nearly sprinting. Past other racers. Past the cart of indignity. Past the local boys who were diving from the bridge and then taunting the riders by pretending to be pulled under water by creatures lurking below. If Tinker Tico slipped, there were no guardrails to keep him from tumbling down. But on those tracks, with banana plantations behind him and ahead of him, he was willing to risk anything to get somewhere. Everyone’s goal at La Ruta, at least in the short term, was to get to the beachfront finish line at Playa Moín, on the edge of the blue-green Caribbean. But there is no graceful way to complete the world’s toughest bicycle race. On the second day, a rider was approaching the stage’s finish line when he lifted his bike in exhilaration — only to get clotheslined by a low-hanging vine. On the final day, dozens of riders wiped out on a turn as they crossed onto the beach, eating sand only yards from the journey’s end. Others turned their pedals once or twice in the sand and then gave up and walked the race’s final 30 feet. Those who did finish the race celebrated in different ways. They crossed the finish line in happy tears. They staggered toward friends and relatives, posing for photos and receiving hugs and kisses. Others walked off in a daze, or limped off toward massage tables. A few grabbed beers and chugged them. One group of riders simply dropped their bikes and dived straight into the Caribbean. They remained in the gentle waves for a long time, bobbing up and down in a big circle and laughing about how they had beaten a race that had tried to kill them. Tinker Tico hung around the finish line for more than an hour. Someone had given him a flag of the town of Siquirres, and he alternated between waving it and wearing it as a cape. The previous day, he had flipped over the handlebars of his bike in a crash, making a dinner-plate-size section of his left thigh swell and turn black-and-blue. But after finishing the race, he walked and walked — for hours, until the sun went down, and even afterward — pausing again and again to stop fellow riders and ask them to sign his flag with a marker. It was Tinker Tico’s best La Ruta finish ever, enough for a $150 cash prize and a free entry, worth $550, into next year’s race. It was the biggest day of his life. With the sun long gone and the punishment behind him, Tinker Tico said he would take a few days off to enjoy the accomplishment, but that would be enough rest. He had to keep moving, to keep pushing. Christian González in a moment of exhausted bliss after completing the first leg of the race.